Lockitron has announced a new hardware product that attaches to most deadbolt locks and allows the door to be locked and unlocked via an app. It also takes advantage of Bluetooth 4.0 to unlock the door when a registered iPhone 4S or 5 approaches the door. Lockitron previously had a lock that was a full replacement for the entire lock and handle making it nearly impossible to use for customers who rent. 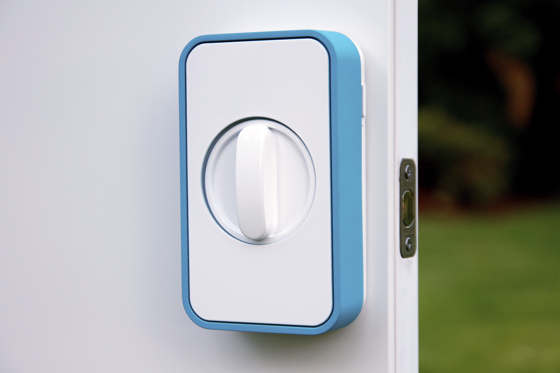 The new device attaches to a deadbolt without any permanent changes, allowing renters to use it. The company is positioning the device for tech-savvy consumers, as well as those looking to open the door for guests or AirBnB renters. Users can unlock their doors via the Lockitron app, via an SMS message, or by using Bluetooth 4.0 to unlock it wirelessly. The company is currently taking preorders for the $149 lock, though the company won't take payment until the device is ready. Lockitron expects the first 1,000 units will be ready for shipment in March of 2013. They get your phone, use the slide-up-to-camera to bypass your lock code, see you have the Lockitron app, find your name and address in Contacts, then ask Siri for directions to your home. Done. One slight flaw to this theory... Maps. So nice, until you lose your phone. Then just imagine if someone steals it. what are the odds that someone steals your phone, figures out you use this product, finds out where you live and breaks in before you can get home and take it off? That's why you should always passlock your iPhone. So you just walk up to the door with your iPhone, and it uses Bluetooth 4.0 to connect and immediately unlock the door? How does it know you're approaching from the outside rather than the inside? Anyway, this sort of thing is nothing new. Any home automation system worth its salt has remote locks. The notification on door-knock is new (at least to me), but who ever knocks on doors anymore? You're better off with a smart doorbell. Of course, they all have the same issue of losing your remote device, whatever it is, and it's not like somebody needs to go through your front door to get into your house. If you're going to go the home automation route, why not set up some motion sensors inside the house watching all your windows and doors, and tell the house when you come and go? Heck, you don't even have to bother locking your doors, and you'll know the minute somebody's in your house when you're away. Door locks are just a social contract. If somebody wants in, they don't need to steal your key, physical or digital. Your first premise is false: that simply is untrue and will not work. You must enter the passcode to get to the home screen. HOWER, they can simply tell Siri to "take me home" from the lock screen and Siri will do it. If "home" has not been learned they can ask Siri "who am I" and that will reveal the owner's name and address. Then they can ask Siri to take them there. Finally, they can say "launch lockitron" to see if the app is installed. If Siri doesn't say "it doesn't look like you have an app named lockitron installed" but instead asks for passcode they will know it is installed. They can't run it but they now know you probably have that lock. Odds of the person who found/stole your iPhone knowing all that, and also being a criminal who will rob someone's home? I'd say 1 in a billion. Annoying as hell, but so worth it! I wish there was "don't lock when on this SSID or at that location" option! With Apple Maps they'll probably end up 20 miles away from my place at the bottom of a river. Just pre-odered. Why? I don't know...but I like it. It doesn't matter. If you approach the door from the outside or inside, you'll want it unlocked to pass through. Say somebody you don't know rings your doorbell. As soon as you walk up to the door with the phone in your pocket to ask who it is, it unlocks? Not good. Or what if, as others have pointed out, you're just walking past the door and didn't intend to unlock it? You might not even realize it's unlocked. Also not good.